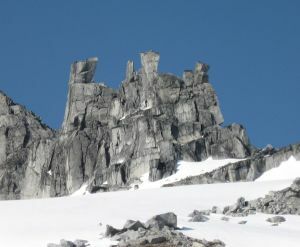 A tight cluster of small rock towers located between Castle Towers and Mount Carr on the east side of Garibaldi Lake. The first ascent was a covetted prize for many years, with the second ascent coming merely a few days after the first. Name Notes: The peak was named after Phyllis Beltz, who likened the peak to a locomotive with the highest tower resembling the smokestack. The name is spelled with an apostrophe and then "s" on the 1:50K map. Eg: Phyllis's Engine.